I love reading about the wacky adventures of crazy motorists who want to push themselves and their vehicles to the limit. A trip I just read about which sounds awfully exciting is the attempt to break the time record for travelling from Cape Town to London. This is a dangerous and unpredictable sort of a trip and just to make it that bit more exciting the Brits doing it are going to drive a Fiat Panda. 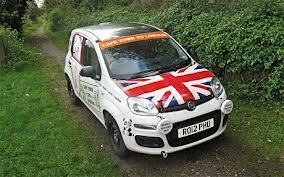 Philip Young and Paul Brace are the guys who are going to travel around 10,000 miles across Africa and Europe in a city car with a tiny engine. Their starting date is the 1st of February, and to beat the record they need to be drinking tea in London and telling their tale to all and sundry less than 14 days, 19 hours and 26 minutes later. Their rather ambitious target is to do the whole trip in 10 days. Their car of choice is rather unlikely but they appear to be confident that an 875cc Panda will help them handle the huge distances, the unpredictable roads and the wild animals which they could meet on their way. The daredevils think that the minimalist approach could do the trick and they are taking a roll of tape, a hammer and a spanner with them as their only tools. Oh hang on a second; they are going to pack some superglue in the Panda as well, so that’s alright then. Of course, there are some advantages to choosing a Panda. For example, it is fuel efficient and with an extra tank fitted to it the couple of adventurers expect to do around 600 miles between fuel stops. To avoid unnecessary stops they will eat self heating food and take turns sleeping and driving, although the cramped conditions and the lack of air conditioning could make things less than ideal. Good luck to these brave guys and I look forward to reading about their progress next year. This entry was posted in Musings, Popular Cars, Small Car and tagged Africa, air conditioning, car, Europe, fiat, fiat panda, London, LS, LV, mini, MoT, motorists, Panda, Paul Brace by Robert Bell. Bookmark the permalink.